The PDF download above gives more details and pictures of the history of Dover from 1944-1994. While Dover Avenue Alliance Church had its official formation in April 1944, the story of God's faithfulness precedes formal recognition of Dover's historical roots. Dover's tie to the Alliance's beginning was Dr. R.R. Brown (aka Rah Rah Brown). Dr. Brown was a soloist and song leader for Dr. Simpson. 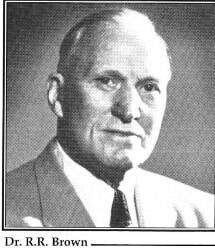 He later became the first superintendent of the Western District of the Christian and Missionary Alliance, the founder of the Omaha Gospel Tabernacle (now Christ Community Church), and a pioneer in radio ministry. 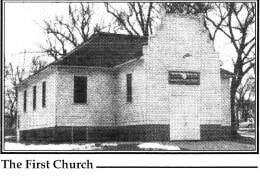 Among those who became a part of the World Radio Congregation on WOW Radio, which began on April 8, 1923, were the founders of the Orange City Gospel Church which today is Dover Avenue Alliance Church. Some ten years later, the dream of what is now the Okoboji Bible and Missionary Conference began to take shape. The purpose was to provide a summer Bible and missionary conference for World Radio Congregation. Lake Okoboji, in northwest Iowa, seemed centrally located for the conference. The conference was held August 4-11, 1935. The purpose of the conference as set forth in its Articles of Incorporation in 1946, was and remains "...to conduct summer Bible and missionary conferences and other religious activities incident to the propagation of the gospel of Jesus Christ in the United States and foreign lands, and the promotion of the work of the church of Christ both at home and abroad." Among those who participated in and learned from the wealth of speakers and missionaries at the interdenominational conference were the founders of Dover. Among the speakers were Billy Graham and Dr. Richard De Haan. Through these ministries and times of Bible study and prayer that began in 1942, the interested believers, who became part of the founders of Dover Avenue Alliance Church, were convicted of their personal need to seek a life of true spiritual worship upon the confession and forgiveness of sin by Jesus Christ and the desire to lead others to this spiritual victory. The former conviction lead to a belief in believers baptism by immersion. Several of the founders acted upon this conviction at the summer conferences by being baptized in the waters of Lake Okoboji. The latter conviction lead this group of believers to sponsor various meetings in the town hall in Orange City. Separate meetings relating to the prophetic teachings of scripture with an emphasis on the premillenial return of the Lord Jesus Christ and missionary conferences were held. 1. To develop and maintain a spiritual church, cultivating true worship, seeking to lead people to Christ and into a life of spiritual victory through sanctification of the Spirit. 2. The pulpit would be open to honored servants of God regardless of their denominational distinctions. 3. To hold Bible and Missionary Conferences and special meetings from time to time. 4. To seek to give Gospel privileges to the neglected school districts in this area. 5. To promote foreign missions on a world wide basis. 6. To financially support the work through tithes and offerings. When a special need arises, the matter shall be presented to the Lord and special offerings taken. No funds shall be raised by assessments or charges of any kind. The first special meeting was held of Sunday, May 7, 1944, with the Palermo Brothers. The first evangelistic meeting with Dr. J.H. Hagar was scheduled for September 11-15, 1944 and the first Missionary Convention was held October 22-27, 1944 with Dr. Turner, Rev. Woodward presenting slides, Rev. Ben DeJong, Dr. R.R. Brown and undesignated missionaries. Communion was served the first Sunday of each month. The second Sunday of every month was Missionary Sunday. Throughout its history, Dover Avenue Alliance Church has had a keen interest in supporting foreign missions. However, early Sunday School records show support was given to such organizations as The Bronx Messianic Center for its work among the Jewish population in New York and Indian mission work started by C.J. Mason, a past superintendent of the Northwest District of C&MA. The first missionary sent by the Gospel Church was Tracy Huitink. She went to Arabia under the auspices of the Sudan Interior Mission (SIM). Tracy was commissioned on December 16, 1945. Tracy Huitink was the first but not the last member of Dover to enter full-time missions work. Dover has had ministries for young people, Alliance Women, active Sunday School programs, community programs like AWANA, MOPS and Moms in Touch, and Missions week. Foreign missions continues to be a point of emphasis with different members of the congregation involved in mini-missions trips of service and the active support of those involved in full time missions work. The Orange City Gospel Church was organized but without a formal place to meet. 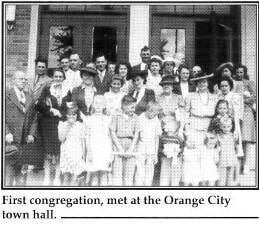 On May 25, 1944, the congregation agreed on the basement of the Orange City Town Hall as a public meeting place. The congregation made a commitment to rent the basement for twenty weeks at the rate of $2.50 per week on June 29, 1944. Whereas the building on the property offered by the brethren Steensma and Vogel can be conveniently made into a suitable meeting place for our various church meetings; and Whereas the grounds are adaptable for tent meetings; The Board recommends to the congregation the purchase of said property from the above named brethren for the consideration of $3350.00, this being the price for which this property has just been purchased. The congregation unanimously supported the board's recommendation. The purchase was funded by a special building fund offering on February 18, 1945 which raised $2644.32. The sum of $2050 was applied to the purchase price and the balance was financed by a note and mortgage for the sum of $1300.00 for one year. The balance of the offering was retained in the building fund. The note and mortgage were to be retired by the use of the entire afternoon offering of the last Sunday of each month. 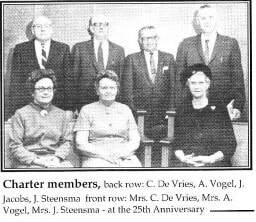 On May, 14, 1945, Brothers Steensma and Vogel were authorized to represent the Orange City Gospel Church, with the power to act at an auction of the Middleburg Christian School. No purchase price is noted in the records of the church. The May 28 minutes show a report by the building committee as to the purchase of the building and plans for a basement on the church property and moving of the building. 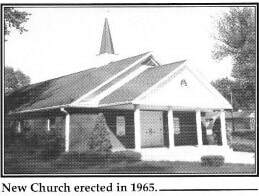 The August 30, 1945 minutes reflect the building was on its foundation on the church's property. This would be east of the current library. The board recommended to the congregation spending the sum of $1500 to make improvements to the building which the congregation increased to $2000. The first church service in the new building was held on Sunday, December 16, 1945, and on the same Sunday Tracy Huitink was commissioned as a missionary to Arabia. The Rev. Harold B. Street was the guest speaker. The building was dedicated in March 1946 with Rev. Benjamine DeJong of Ashton conducting a week of services. This was shortly after the special congregational meeting on January 1, 1946, to adopt the Articles of Incorporation and Bylaws to formally incorporate the church as a legal entity. Pews were first purchased for the Gospel Church from A.B. Simpson Memorial Church in St. Paul for #300 on October 1, 1951. The membership of the church did not increase greatly for some time but as it grew there developed a strong desire to erect a new church building. In August 1964 plans for a new building were formulated and the new edifice was dedicated on October 31, 1965, during the tenure of Rev. Hadley. The prayer of dedication was offered by Rev. Woodward. It was also at this time that the name of the church was changed to Dover Avenue Alliance Church. The cost of the new building was $55,124.00. In 1975 the original parsonage was replaced with the present structure built at a cost of $66,550.00. Later, during the tenure of Rev. H. Elgersma, an educational and office wing was added in 1978 at a cost of $90,832.00. This wing was dedicated on September 17, 1978. As the church continued its rapid growth it became necessary to build the present sanctuary, fellowship hall and nursery area. The sanctuary work began 1981 and was completed in 1982. The first Sunday in the new sanctuary was February 7, 1982. The fellowship hall and bathrooms were completed in 1988.